Saffire II is the newest product of the British “The Funk Firm” that comes from a brand that in the 80's was quite famous: Pink Triangle. All the products of this brand have a common aesthetic, with different finishings and a belt drive. This is a 5 kgs device, so the test of this turntable has been easier than the average since the four floors with no elevator that lead to my room have been, for once, a pleasure. Oh yes, this Saffire II is beautiful: transparent, light and curvy. The plexiglas finishing is very well refined, the chrome finishing of the engine and of the power source is not very delicate but it is made somehow more delicate by the curvy shape. I'm not very keen about the small light that, from the inside, lights up the whole chassis. Anyway, it's a matter of personal tastes; many friends that have visited me while the turntable was in my house, liked it a lot. 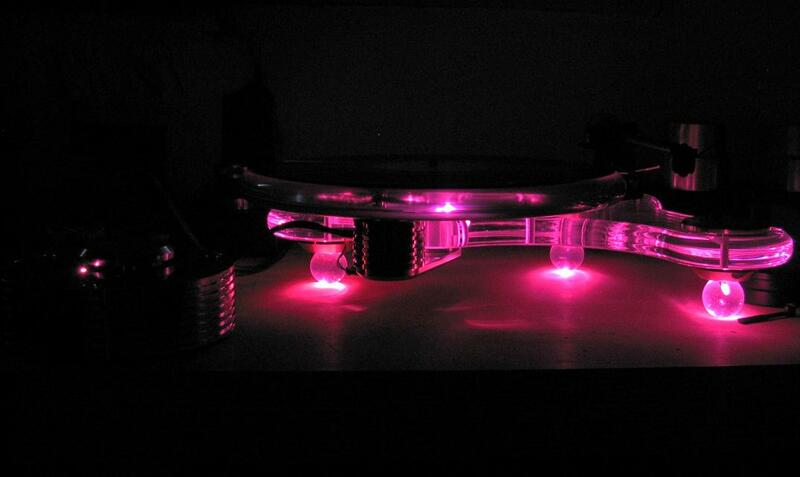 All in all, the transparent turntable and the internal light have a particular scenic effect and the final "like "or "dislike" is on the final user. 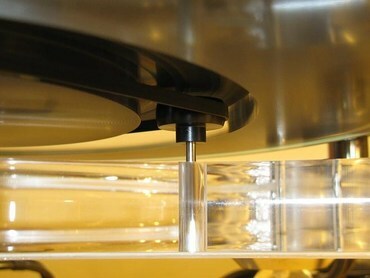 The turntable framework is smaller at the base and is built in transparent plexiglass, with the small feet stuck to it. It's a light turntable, similar to those Regas, those devices that do not accumulate the energy that comes from the outside. The turntable comes with the motor already connected, the slot for the two optional pulleys and the pivot that has no sphere of any material, and that will host a reverse bearing, on which the platter must be mounted. Inside the box there are many small bags. In one of them there is the bearing, in another one there is the lubricant graphite-oil, a drop of which must be put on the bearing. Once done this, one must take the bushings of two different sizes and put them on the two different metal pivots that come out of the base, and then slide the belt around the three points that can be seen in the picture, and then position the platter that has the sub-platter stuck to it in one unique piece. (The picture is very clear). All very simple up to here, but when it comes to positioning the platter and putting the belt around the sub-platter, the going gets tough. It's not simple at all. Two points of the belt are easily reachable with the fingers, but one is between the platter and the chassis and cannot be reached. Using a thread that will be also useful to pull the belt towards the outside it'll be possible to position it correctly in order to use it. I must say that there are also two small plastic wheels that must be put on two pulleys that offer a certain grip and during the whole procedure the belt does not fall off easily. If you keep calm and try two or three times you'll have the platter ready to turn! The power source must be connected now, it's the bigger cylinder and it can be set at 33 or 45 rpm and it has no fine tuning. In my room 33 rpm were perfect and 45 rpm a bit too fast (but just a little bit). Close to the power cord, there's the small switch that turns on the internal light. The platter is light but well damped, it needs no clamp since its upper surface is made of rubber and the disc does not slide. It's not easy to change the side of the record, since the platter is bigger than the disc and has rounded sides. You must stop the platter and change side. The belt seems to be strong enough not to be worn by this "start and stop" stress. 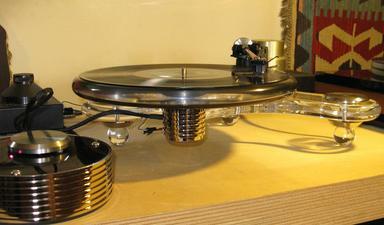 (Many people in fact think that a turntable should not be turned on and off frequently to avoid stressing the belt.) Anyway, Funk Firm has a very light platter so the start is really fast and easy). The base of the tonearm, that has a Rega housing, is made in carbon fiber and comes in its … small bag. A user's manual more detailed would be very useful since it's not easy to understand if the arm housing must be put close to the platter or far from it. The base is oval and can be positioned either ways. Anyway with a ruler you can check which is the position of the hole that allows the right distance of the tonearm and the centre of the platter. In another plastic bag you can find the screws to fasten the ring, to let the tonearm pass. 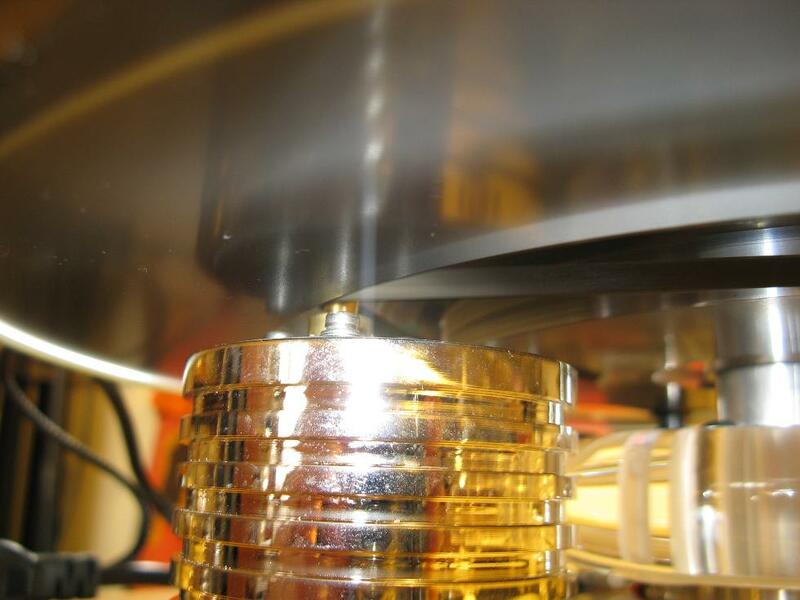 The tonearm must derive from a Rega. The tonearm must not be screwed from under but it has a smooth pivot, so that the height can be adjusted with a allen key. 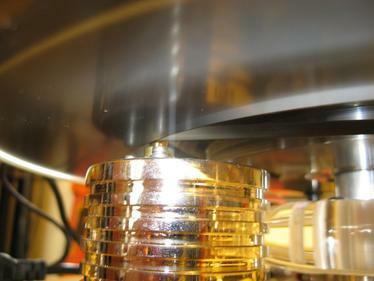 Rega asserts that adjusting the height is an audiophile fancy but I prefer to adjust very carefully the VTA. 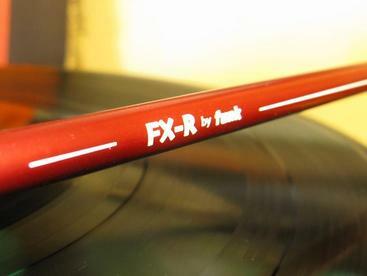 The Fx tonearm comes from the REGA RB 301. The bearings inside are different, as different is the headshell, that does not have the usual design. It has a slide system similar to that of Clearaudio, it's very rapid and effective and the cartridge alignment can be done in just few seconds. The tonearm works in a very high position since the headshell and the cartridge are high, so the back of the tonearm is unusually high, too. The FX hosted both the Denon SL1 and the DL 103 Denon, with good results. The friction was really low, so careful if you do not have the arm lifter in the up position, because you may scratch the vinyl. Well, all this said, I connected the device, mounted the Denon Dl S1 and off I go listening to my records. Bauer Audio DPS 2 turntable, Mørch DP6 tonearm, Transfigurationa Aria and Denon DL 103 cartridges, Pioneer PL 550 turntable with Ortofon MC 15 Super II cartridge, American Hybrid Technology –P e Lehmann Black Cube phono preamplifiers, Olimpia Audio Guglielmo II and Spectral DMC12 preamplifiers, Spectral DMA50 and Wyred4Sound ST 250 power amplifiers, Audio Note AN-E SPx loudspeakers, Systems & Magic, Kimber Kable, Audio Note, YBA and other cables. This component technology is similar to Rega or to the small Pro-Jects ,or again to the Tarantella of the same Pink Triangle. The sound does nothing but confirm the fact that it's a light turntable. With the Denon SL we obtain a very beautiful high range, never exaggerated, never too crisp; a medium range clean, very detailed and a low range much lighter than the reference components: Bauer DPS, Revox B795 and Pioneer PL 550. The low range is not short in its extension, it's just a little bit rearward. The sound, all in all, is very clear and allows you to distinguish every single hue of the recording. Those that like rock may not agree with this. The punch of some recordings is a bit rearwarded (the old Pioneer is better to listen to rock, but it's an old component and has characteristics that the new Saffire II, a more modern project, does not have) but for those that listen to a lot of vocal Baroque music, i.e., the clarity of this turntable is a plus. As for the tonearm, I have a base of the Bauer DPS with a Rega template and a tonearm Rega 300 modified by Bauer that has the same connection of the FX. I have compared the Rega 300 and the tonearm FX and I must say that the Rega sounds more “silvery “than the Fx, that is more balanced. Using the same cartridges - DL 103 -I have tried to compare the Saffire II with the FX and Bauer DPS with the Morch DP6. In all the recordings that I have listened to the medium and acute range where very similar with small differences, the energy though was the same. Listening to music played by many instruments, the low range of the Bauer offers a sound message that is more complete. In Munich I went to a concert that I have described in these pages and when I came back home I listened to a London recording of the Romeo and Juliet by Pròkofiev directed by Abbado. With the DPS the bass is very present, very alive, very similar to a live concert but it's also true that the high range of the Saffire II is not different to that listened to at the live concert. The sensation of lightness that cames from the bottom has been confirmed with all records, exception made for the Missa Bell'Amfirit Altera by Orlando di Lasso. This is a record sang “a cappella” that has no deep basses and the eight voices are really enjoyable. I have listened with pleasure to the soft hissing of the choir, the position of the singers on stage, the silvery timbre of the treble voices and also a nice reproduction of the soundstage with many resonances (maybe made on purpose but that gave the sensation of being in the church). Someone may think that this Saffire II has no basses. It's not so and all those that have had in their house many turntables, already know the answer. As I said, the advantage of the very light chassis is that of a very quick sound that, at times leaves something behind and also the sensation of a heavy sound. Nothing's missing but for some music generes it may be useful to look for a cartridge and a pre amplifier that may somehow balance this tendency of the turntable without changing the characteristics of its sound, its speed and its ability to take out the sound from the grooves, that is its feature. Fun is guaranteed, believe me. Please note that The Saffire II has also a good dynamics. One last thought. This turntable is really nice. The sound is good. Everything's good. I'd only suggest to the producer to include a user's manual. The leaflet that is included is definitely not enough and furthermore there's just the English version. A request to the importer: please help the Italian audiophiles with a translation and few illustrations of the assembly of the belt and the tonearm. Few words on the price. The tonearm - around 1.750,00 euros - is in a price range without many competitors, it's kind of universal and worked well both with the DL 103 and with the Denon DL S1 catridges. The turntable - around 4.000,00 euros - is a very good product and it's also very beautiful but has many competitors so it won't be easy. Let's see if audiophiles will choose the heavy German turntables or the lightness, also in its look, of The Funk Firm.